So how do you tell the US version of the Sony Alpha A700 apart from it’s European cousin? The US version includes Sony’s version of the Minolta Grip Sensor, while the European models don’t. This isn’t a case of Sony short changing European customers. Although the details are rather murky, it appears that the Grip Switch is made of a nickel alloy, and the European Union recommends that nickel not be used in proximity to human skin for lengthy periods. So apparently Sony decided to follow along with the recommendations and simply eliminated the grip sensor from the Alpha A700 models bound for Europe. This also applies to the add on vertical grip, the European models of both the camera and the accessory grip are sans the Minolta style grip sensor. Here’s where everything gets sort of fuzzy. Apparently the recommendation is just that: a recommendation, not a law. So Sony probably wouldn’t have broken any regulations by including the grip sensor in European Alphas. No one seems to know whether Sony simply chose to voluntarily remove the sensor for the Alpha models sold on the European continent, or whether the European Union used some political muscle to force their hand. Grip sensor on the Sony Alpha A700 helps prevent unwanted Eye-Start trigger, but don’t look for it in Europe. Basically, the grip sensor is a useful addition to the Eye-Start system available in the Alpha A100 and many Minolta cameras. Eye-Start allows the camera to be in a low power standby mode until you raise the camera to your eye. When the camera senses your eye near the view finder, the camera changes to full operation, including metering, auto focusing, image stabilization, etc. When you move the camera away from your face, it returns to standby — a feature that can greatly extend battery life. The problem with the eye-start system is that it can’t always tell your eye from your shirt sleeve or your pant’s pocket. Dangle an A100 on a neck strap while you wander about and the camera may turn on and off constantly as the camera falls against your clothing. It thinks it senses your eye, so it powers up the LCD, and attempts to meter and focus, even though you have no intention of shooting anything. You can turn the camera off, but then if something really interesting turns up, you have to hope you don’t miss the shot while the camera goes through it’s start up sequence. Neither choice is very appealing, and many people have criticized the eye-start system because of the phantom power up cycles. As I’ve said before, it appears that Sony listens to it’s customers, because they have corrected a number of issues that people had with the A100. One of the things they did was reach back into Minolta film SLR technology to bring back the grip sensor. If you have the grip sensor mode turned on, the A700 will remain in standby, even if it thinks you are looking through the viewfinder. Only when your hand is covering the sensor and your eye is at the viewfinder does the camera become fully operational. Or least that’s the way US versions of the A700 operate. If you are wondering why the switch has to be made of nickel, instead of some other material, the grip sensor is not pressure sensitive. Instead it actually uses a small electrical field across your skin to sense that your hand is there. So the sensor has to be made of a conductive material and Sony apparently couldn’t find an adequate substitute for nickel. Many have pointed out the European Union recommendation are aimed primarily at things like ear rings and other body piercing jewelry. Simply touching nickel probably doesn’t present much danger for most users. Some people apparently have or are prone to develop allergic reactions to nickel. Let’s not forget the electrical current involved in the switch. It’s very small, but perhaps it could aggravate an allergy in someone using the Sony A700. So no grip sensor for the Europeans, at least until Sony finds another material for the sensor. Does this mean that US cameras will cause allergies? I rather doubt it. There might be some people with a severe skin sensitivity that could be adversely affected by the nickel in the sensor. On the other hand, you find nickel in all sorts of products, from automotive controls to fountain pens to silverware. Most people aren’t bothered by these items — I sort of doubt that a camera control will have a much greater effect. Of course, I am not a doctor, so if you have a nickel allergy, you might want to discuss this with your medical adviser. Remember that Minolta has made long use of a similar nickel grip sensor in the Maxxum/Dynax 7 and 9 as well as the A2 and A200. I haven’t heard of a rash (no pun intended) of photographers developing skin allergies from using these older Minoltas. Why choose a electrical sensor over a switch? Which leads to my next question, why exactly did Minolta choose to use the nickel sensor in the first place? A simple pressure switch would be cheaper, could be made of any hard materiel and could even be used with gloves on — something that can’t be said of the nickel sensor. About the only reason I can think of for choosing the nickel sensor is that if you left the camera on when you put in a camera bag, padding or other equipment might possibly trigger both a pressure switch and the eye start system — running down the battery. Because the grip sensor actually measures current through your skin, it can tell the difference between a hunk of foam rubber and the fingers of your hand. Yet Minolta long ago developed technology that could eliminate false triggers and didn’t require any electrical skin contact. Im refereeing to the Senswitch that appeared on the Minolta XK cameras in the mid seventies. The Senswitch was just simple pressure switch that turned the camera meter on when you touched it. It saved battery power, because the camera could be left in standby until the user pressed the switch. I’ve heard that a lot of XK owners didn’t like the Senswitch on the basic XK model. It was just a long strip on the front of the camera, and apparently many photographers had trouble engaging the switch consistently. And it would also be vulnerable to pressure from other sources like the foam padding that could press upon it and drain the battery. Minolta, however, followed up the plain vanilla XK with the incredible XK-Motor. This wonderful camera was my main shooting machine for many years, I loved the Senswitch on the XK-M, because Minolta moved it from the front of the camera to the inside of the built in grip. 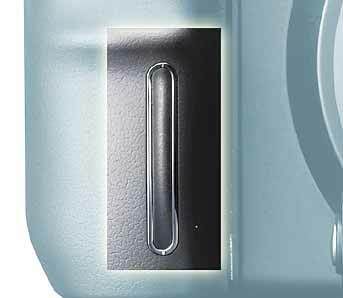 You would have to work awfully hard to miss engaging the Senswitch on the XK-M. If you were holding the camera by the grip, your middle-finger just naturally fell upon the switch. You almost couldn’t miss it. Located deep inside the recess of the grip, the XK-Motor’s Senswitch was also fairly invulnerable to being pressed accidently by something other then your finger tip. I’m not saying it would be impossible for a hunk of padding or gear to engage it…but it would be a very rare occurrence. I never saw it happen in all the years I shot with my XK, Then again, I usually switched the camera off when it put in the bag. One final thing. The XK-Motor’s switch was made of some sort of hard plastic , so you could use it with gloves. 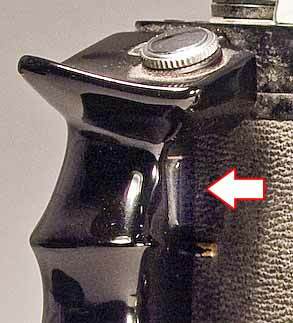 It seems to me that Minolta had almost fool proof system with the XK-Motor’s Senswitch. Too bad Sony didn’t study the XK-M grip before opting for the nickel grip switch on the A700. It works even with gloves, it is fairly safe from accidental triggering and it won’t cause skin allergies. Oh yeah, they could sell the Senswitch in Europe as well.